A study to improve the HvZ experience through User Centered Design research and methods. In Intro to HCI our class formed teams of 4 tasked with solving a problem within the theme "Connected Campus." Our team chose to explore "Mass Spatial Games" a term we coined referring to in-person gameplay over a large spatial area. We specifically focused on a week-long variant of tag called Humans vs Zombies (HvZ). We first researched the game itself, then developed designs to help increase players' immersion, ultimately building a prototype that we tested with a mini-game to gather feedback. To get a better sense of the research space, we interviewed 5 game "admins" - these people are in charge of running the game. The interviews were semi-structured so we had some initial ideas, but were free to further explore stories we found interesting. We took the insights from all the interviews and organized our thoughts in an Affinity Diagram. Diagramming surfaced several interesting insights. We originally assumed that all players would play both sides of the game as intended: as human before getting tagged and as zombie afterwards. Instead we discovered that some players would "rage quit" once tagged, or "suicide" in the beginning of the game to become zombies earlier in order to only play for the side they preferred. Additionally, stress is a major factor of the game and careful management of stress is key to a successful experience. Finally the admins expressed that the tagging interaction was sub-optimal and had room for improvement. Armed with this information, we got ready to play the game itself. 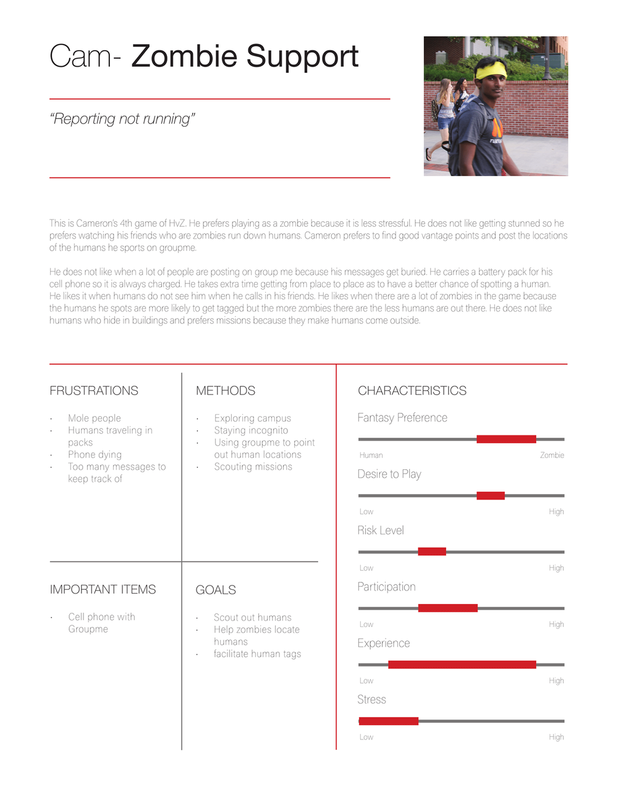 For the game week, we chose to use as many methods as possible to gather data about the game. Myself and one other researcher volunteered to ethnographically study the game by playing it ourselves. One researcher was tagged the first day, while I made it to Friday, giving our team a pretty good sense of play interactions as a human and a zombie. 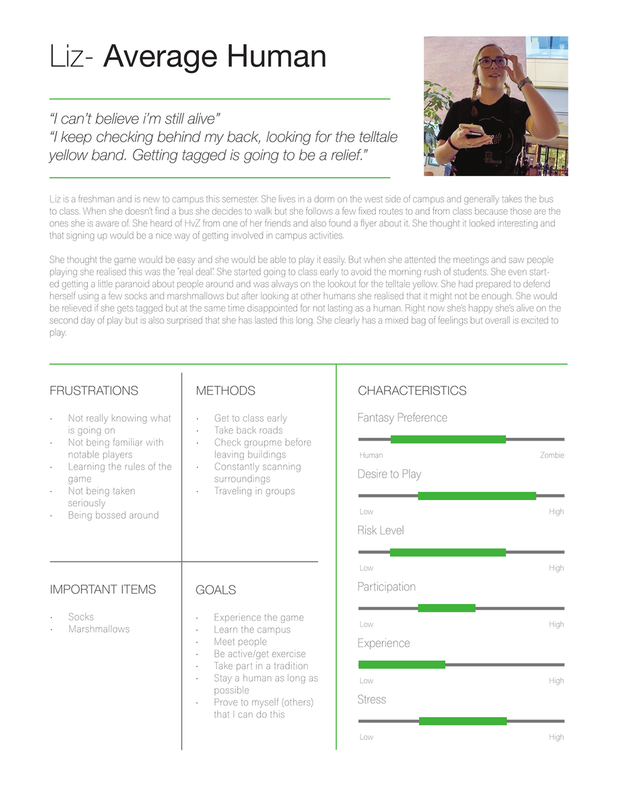 In addition to ethnography, we deployed a pre-game and post-game survey, as well as a diary study which yielded amazing quotes among other things: see the personas. Additionally two other researchers conducted interviews and observed players interactions during the week. At then end we had a mountain of data which led us to our second affinity mapping to make sense of it all. After organizing insights into user needs, we individually generated approximately 10 unique ideas that we then shared with each other and brainstormed with. The process led us to filter the themes down to four major categories: Audience Participation, Communication Stun Tracking, and Location Control. We presented posters with these four concepts to our class mates, and with their feedback chose to move forward with the Stun Tracker, coupled with elements of Location Control. The main idea of the stun tracker is to give the humans more agency in their game play. Currently the game only rewards humans for surviving, which generally means avoiding play as much as possible. While avoiding gameplay helps humans to survive, we found that it wasn't as fun for the human, or the zombies who end up with a lack of victims to chase. Our solution has three parts. We incentivized humans' active play by tracking their zombie stuns, increase danger for zombies by limiting their number of lives, and simplify the tagging interactions. Admins give all players stun coins to carry with them. Humans receive one, where zombies will receive a fixed amount for the day. When a human is tagged, the zombie will take the human's coin and input it into a kiosk which automatically logs the human as killed, thus simplifying the tag/conversion interaction and keeping the players immersed. When a human stuns a zombie, they can (at their own risk) collect a stun coin from the zombie. The "Kill Board" for zombies, which tracks the network and number of kills for each person, is a central feature of the game that has a huge appeal due to bragging rights. The stun coins allow humans to have a similar board, showing who is the best "Zombie Stunner." Additionally, the limited number of coins that zombies will have will serve to limit their lives, causing them to be more tactical in their attacks. We created a functional prototype that scans RFID cards, counts coins and updates the player's stun count, kill count and player status. The kiosk is lightweight and portable allowing it to be moved by administrators throughout the week. Responsive lights make it visible even during evening hours. The interface was designed to reflect a technological apocalypse which was the theme of this semester's game. Borrowing design elements from video game stats pages, the interface also increases player immersion in the story line. Below are the personas we developed from our research that helped to inform our design decisions.